Cause some days just call for REALLY good finger food. It’s Thursday, so I am thinking that by this time of the week we all need a little something fun to push us through till Friday…or maybe that’s just me? 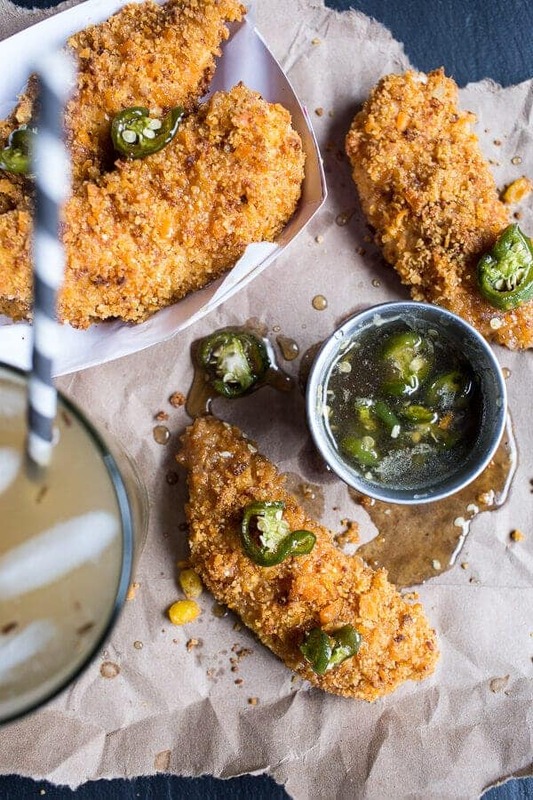 I don’t know, but either way, we should all be making these for dinner because what could be better than cornbread, chicken and jalapeno honey?? So guys, I have random things to talk about today. First up, Snapchat. Oddly, I am really having fun with it. At first it kind of intimidated me, I thought, UGH, not another social media channel (because really, there are so many social media channels…do you guys remember MySpace?? ), but now it’s kind of fun just taking random snaps of my day-to-day life. Which really just means a lot of food snaps, messy kitchens and photo setups. I think I like it because for some reason I feel like zero pressure to have the perfect photos, clean house and such. With Snapchat, you just snap and go. There’s not really any thought that has to go into it and I can post things that are not even close to Instagram worthy. Plus, I will not lie, I love creepin in on what everyone is doing at random points throughout their days. Don’t get me wrong, Instagram is still my all time favorite social media outlet, and I don’t think that will change…cause I love pretty photos, but Snapchat is fun too! Second random chat for the day, I think my brain is going through a major state of exhaustion. You’d think it would be from too much thinking about recipes, too much cooking, too much writing, too much grocery shopping or too much photo taking, but I am pretty much %100 percent sure it is simply from lack of sleep caused by staying up WAY too late watching um…reruns of Buffy The Vampire Slayer and um…One Tree Hill. Did I really just admit to that? I did, I did, but for some reason, after a full day of work, once eleven PM rolls around (because dinner is always way late) all I want to do is watch mindless TV (or well, mindless streaming on my computer) and for some reason these soap opera like teen shows really do it for me. And ok, I was pretty into Buffy throughout my pre-teen/early teen years so it kind of brings me back to being a kid again. Clearly I love that. Forever young please. Also, I will not be hurt if you feel the need to laugh at my television choices, it’s understandable. Soooo anywhoo, I think that’s probably enough embarrassment for one day. 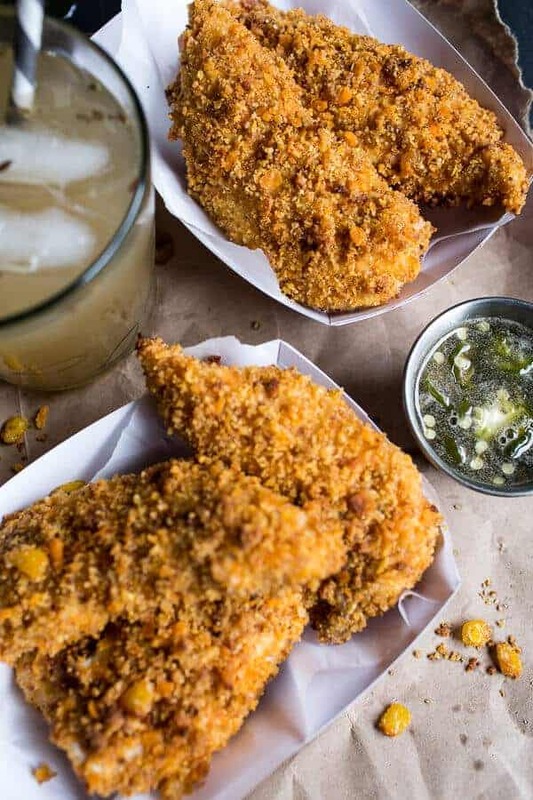 Let me talk about these cheddar cornbread chicken fingers now. Because that’s what I should really be telling you about anyway. As you will soon come to realize, I am on a bit of southern food kick, and today it is in the form of cornbread and honey, maybe one of the best combos around. Plus cornbread just seems to shout “summertime” to me. The weather is finally getting nice (well, not here, but my fingers are crossed that things are going to make a turn for the better here soon), kids are getting out of school (Asher gets out June 2) and corn is starting to flood into the grocery stores (yes!!). So yeah, it’s time for cornbread and chicken…only I took things a step further and made some cornbread crusted chicken fingers. What?!!? I did, I did and they are incredibly awesome. And that Jalapeño Honey Butter??? A MUST. No really, it’s perfect for dipping and a nice switch up from ketchup or BBQ Sauce. 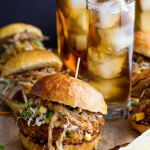 Although, a Jalapeño Honey BBQ sauce would be pretty good with these too! But really, you may end up putting this Jalapeño Honey Butter on and in everything until it’s all gone. Can you say warm baked biscuit?? YUM. Preheat oven to 400 degrees F. Grease an 8x8 inch pyrex pan. Combine whole wheat pastry flour, cornmeal, salt and baking powder together and mix with a spoon. Add the honey, melted butter, buttermilk and egg, stirring until smooth. Fold in the corn and cheddar cheese. Bake for 25-30 minutes, or until top is golden and bread is cooked throughout. Allow the bread to cool completely before slicing. Preheat the oven to 400 degrees F. Line a baking sheet with foil and spray or brush it with the olive oil. 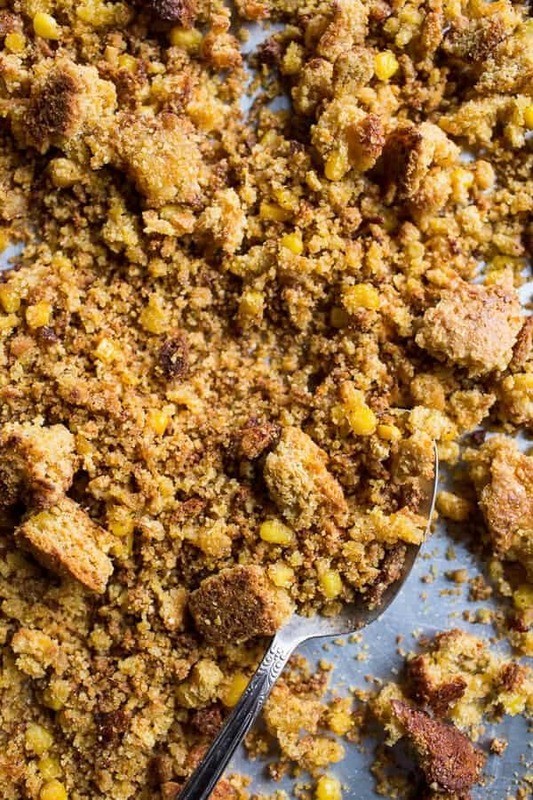 Crumble the corn bread into fine crumbs over the baking sheet. Drizzle the melted butter over the crumbs. Toast in the oven for about 10-15 minutes, stirring once or twice until golden and crisp. Remove from the oven and increase the temperature to 475 degrees F.
Add half the toasted cornbread crumbs to a shallow bowl and stir in the cheddar cheese cracker crumbs. 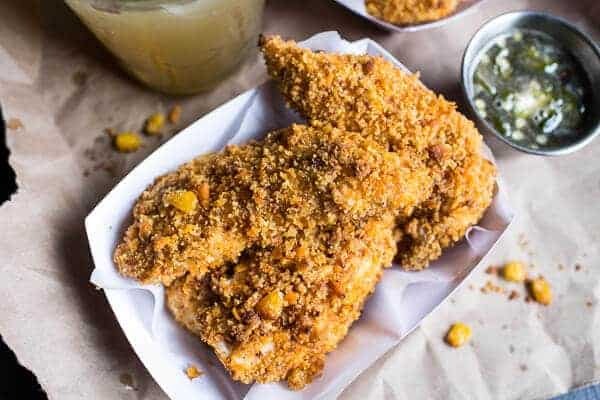 Remove each piece of chicken from the buttermilk, and dredge through the cornbread crumbs, pressing gently to adhere. Place on the prepared baking sheet. Repeat until all the chicken has been used. Make sure not to crowd your pan, if necessary use two baking sheets. Lightly spray the fingers with cooking spray or a mist of olive oil. Bake for 10-12 minutes, then gently flip using kitchen tongs and spray the other side. 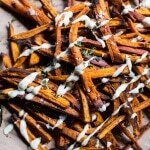 Bake for 10-12 minutes more, then remove from oven and serve with the Jalapeño Honey Butter (recipe below). In a small sauce pan, bring the honey, butter and Jalapeño's to a low boil, cook for 1 minute and then remove from the heat. 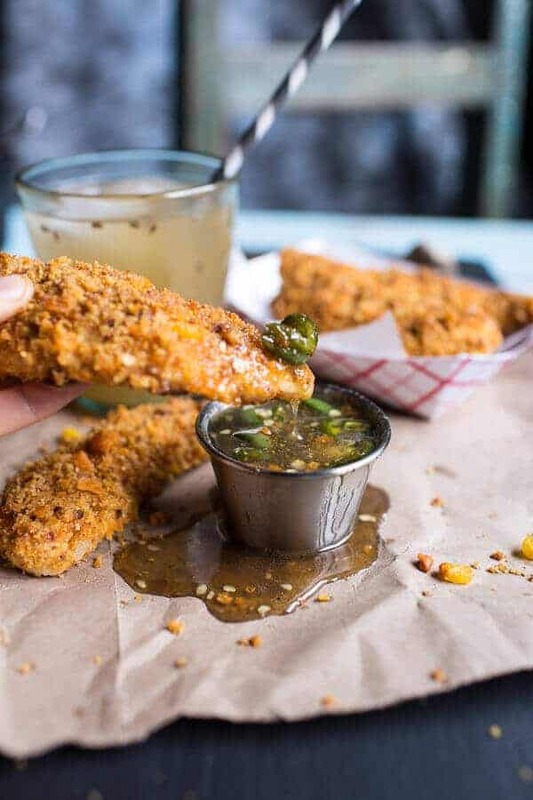 Allow the honey to cool slightly and serve as a dipping sauce for the chicken fingers. 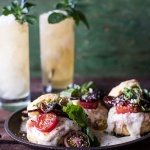 Leftovers can be used on biscuits or your favorite sandwiches! Fingers, are you ready??? It’s time to dip. These look awesome! And yeah, watching Buffy as an adult is so much better (funnier)! The thought of jalapeno honey butter just made my mouth water. 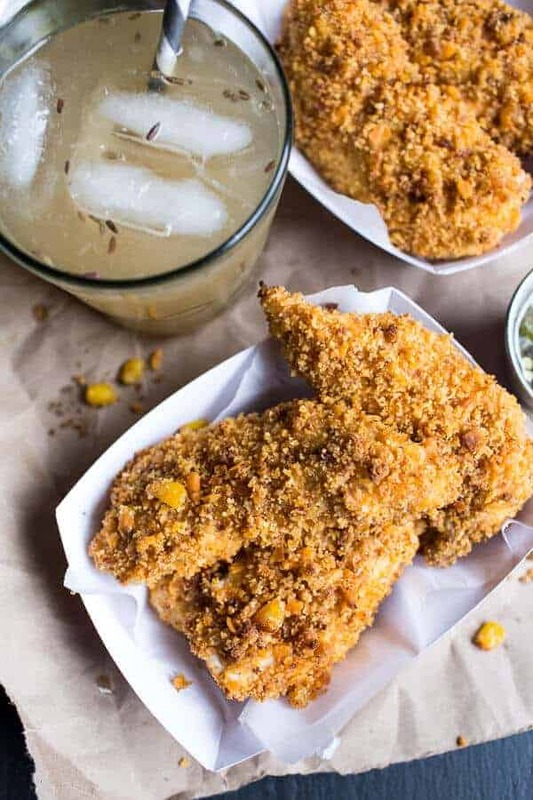 The corn just sticks to the chicken like the crumbs. Yes, you can use all purpose flour. Let me know if you have any other questions. This looks so good! I’m stopping by the grocery store tonight to make this for dinner. Thanks Chris!! Hope you love the chicken fingers!! Making this because anything with cornbread is great. Thanks Nancy! Hope you love the chicken!! I just really want to make out with these chicken fingers. You know, if that would be an appropriate thing to do, which it probably isn’t. They look sooo good. I love jalapeno anything. I really like snapchat for all of the reasons you mentioned. Instagram is my favorite but they are two very different social media platforms. I just followed you on both! If you only use half the cornbread crumbs, what do you do with the rest? Maybe just crumble and toast half the pan of cornbread and leave the rest for plain cornbread eating? I am still resisting snap chat (just like I resisted Facebook and swore I would never give up MySpace). Now these chicken fingers, there’s no resisting them. YUM! I love chicken fingers! The honey butter sounds delishhhhh! That jalapeño honey butter?! YES PLEASE! Love everything you post, Tieghan!! 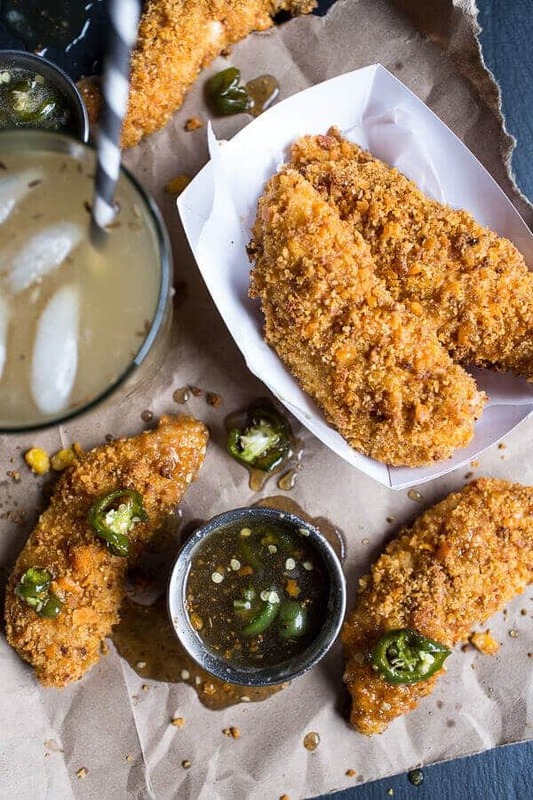 These look like the best chicken fingers ever! Love the jalapeño butter! Ok…I’ll be the one to ask…what is the drink along side the chicken? Looks like caraway or fennel seeds are in it. Wow. 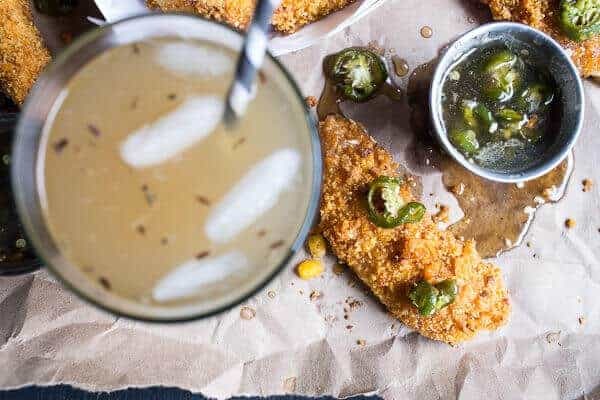 I’m in if we double the cornbread so we can eat some, then make this the following night 🙂 who doesn’t love chicken fingers and these look amazing! 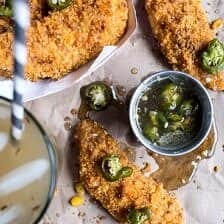 Ok this one is not just for kids because you can give them ketchup for dipping their chicken fingers in that means more of that amazing Jalapeño Honey Butter for me! 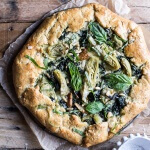 Love this recipe thanks! This looks amazing! I’m going to Pin it and try to make it work for my gluten free lifestyle (Celiac disease). Do you think a prepackaged corn bread mix would work in this? I could add cheese to it to get close to your recipe. Any advice on adapting this? Hi! I think a GF mix would work great!